Do you exercise enough? What could encourage you to do it more regularly? Nike+iPod might help. It’s a brilliantly-conceived product/service from two colossal design-led brands. It hooks on to existing behaviour and clever technology to make the user experience as natural as possible, leverages the people-power of the web, and uses several persuasive techniques to encourage people to just do it a little bit more seriously. The product side of Nike+iPod comprises a sensor that slides into the cavity under the insole of your Nike+ running shoe and an add-on for your iPod. The sensor is an accelerometer (the components that make Nintendo Wii remote controllers work) that senses the motion of your feet. Pulses that correspond to your movement are transmitted over a short-range wireless link to the iPod add-on, which logs the pulses and aggregates them to form data about your run. The product is only half the Nike+iPod story though. Nike have used the web in a similar way to the makers of internet enabled games consoles to form a massive competitive community website. Once you’ve recovered from your run and had a look at your data, you can upload it to the Nike+ website to see how you compare with people all over the world. You can challenge them to compete with you too if you’re feeling combative, or just check out what the top running power tune is – can you guess what it is? Of course the main behaviour that Nike+iPod encourages is the purchase of expensive running shoes (the cheaper Nike trainers don’t have the sensor cavity), but how does it do at persuading people to run more? Let’s look at which of B. J. Fogg’s persuasive techniques it uses. The most obvious technique employed by Nike+iPod is self monitoring (simply allowing people to monitor their behaviour by making that information available to them); the training logs that build up over the weeks let you see how you are improving. During your run, self monitoring on a smaller scale is also given by a voice in your earphones that counts off the miles. Operant conditioning (rewarding the right behaviour – disappointingly there are no punishments for walking) is also used; at the end of your run you get a message of congratulations from Lance Armstrong, Paula Radcliffe or other authoritative athlete (Nike+iPod acting in a social role to persuade). That may sound naff, but from the few times I’ve been persuaded into running by an enthusiastic friend, I would take kind words from anyone – man or machine - during the post-run collapse-on-the-floor period. The idea of tunnelling (submitting yourself to a difficult process, analogous to someone checking themselves into rehab) is also drawn on; the Nike+ website lets you choose a training program for your running and set goals or undertake challenges. Also, an aspect of surveillance is used; the social network side of the Nike+ website allows you to compare your stats with other runners (and other people to see your stats), or challenge your friends to beat your time. Do these techniques actually work? I’m going to suggest a simple experiment. I’ve occasionally thought it would be good to get less chronically unfit, but although I’ve been for the odd scamper, it’s never become regular enough behaviour to do any good. 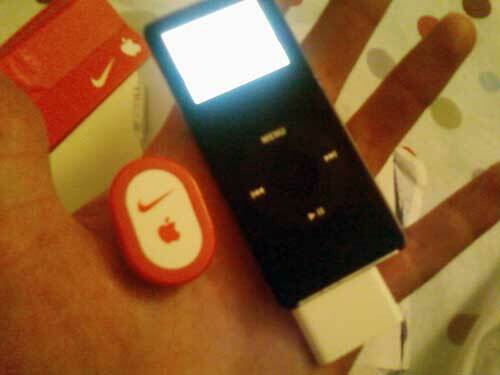 Over the weekend I bought a Nike+iPod kit which I’m going to start using. I'm not pretending it's robustly scientific, but during the next month or so I’ll let you know whether using Nike+iPod helps me make go running more regularly. If anyone wants to join me ("share the motivation, multiply the performance" as the website says), I’ve started a team on the Nike+ website. Sign up or leave a comment if you want to play (you can still play even if your trainers don’t have the Nike+ cavity with one of these things - see update below). Update - Monday 8th December at 14:00 A couple of people have asked about the expensive shoes issue - although Nike would like you to buy these, third parties are offering kits that let you clip your Nike+ sensor to your existing shoes. Although I linked to Runaway above, after a bit more research, the best of the bunch seem to be Marware's Sportsuit. Buy it from Amazon here.